Gently poached to preserve vital nutrients and vitamins, this unique recipe includes a high percentage of bio-organic beef, including a fine balance of muscle meat and vital inner organs. Essential additional nutrients are provided through a carefully formulated mix of quinoa and spirulina algae, complemented by bio-organic vegetables, including pumpkin and carrots to give the food it’s compelling aroma and taste for the most discerning dog. This recipe has been enhanced with fermented Jerusalem artichoke concentrate which has a highly beneficial pre-biotic effect to aid digestion and your dog’s ability to absorb the nutrients in this recipe, together with pharma-grade salmon oil for crucial Omega 3 & 6 fatty acids. Quinoa contains high-quality protein and amino acids, complemented by carrots and pumpkin, rich in beta-carotene. There are multiple benefits of spirulina algae which contains a remarkable concentration of vitamins, trace minerals, the rare essential fatty acid GLA and beta carotene. These are known to promote a healthy immune system and be beneficial for eyesight. Boeuf du Cap represents A Taste of Cap D’Antibes, and is inspired by The Rockster’s Journey. 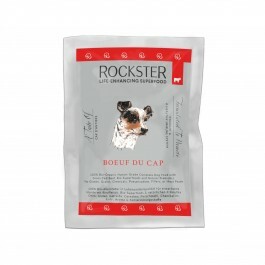 What is in Rockster Boeuf du Cap? Ingredients: 82% Bio-organic beef (muscle meat, heart, lung, liver, rumen), 6% Bio-Quinoa, 5% Bio-Pumpkin, 4.5% Bio-Carrots, 1% Bio-Spirulina algae, 1% Salmon oil (pharma grade), 0.5% Bio-Fermented Jerusalem artichoke concentrate. Naturally Derived Trace Elements per kg: Zinc (as Zinc Sulphate Monohydrate) 0.8 mg, Manganese (as Manganese-II-Sulphate Monohydrate) 0.3mg, Iodine (as potassium iodite) 0.1 mg.
Analytical Constituents: Crude protein 11.6%; Crude oils and fats 6.9%; Crude fiber 0.9%; Crude ash 0.9%; Calcium 0.35%, Phosphorus 0.25%; Moisture 78%.